New concepted residence for long-term guest in Gangnam! 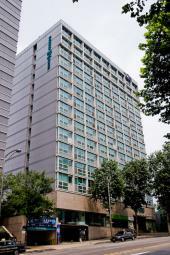 Gangnam Family Hotel opened in June 2003. It provides a complimentary breakfast buffet, sauna and a new-type of living space for longterm guests. There are 195 guestrooms total with same layout for each room type. Double rooms are appointed with a king bed and Twin rooms with double and single beds (additional beds are not available). They are also equipped with LAN line, furniture, and kitchen systems. All are available in Ondol style, offering warm floors during winter and air-conditiong in summer. Located in Gangnam, a bustling mecca with students and businessmen, there are numerous restaurants, coffee shops, bar, book stores, record shops movie theaters and esthetic centers nearby. It enjoys great transportation as well with Gangnam station (subway line 2) and Nonhyeon station (subway line 7) within 12 minute walking distance. Yeoksam area full of high-end stores is also 15 minutes away. 10 minutes away are COEX Mall with shopping, dining and entertainment opportunities and trendy shopping areas Apgujeong and Cheongdam-dong are at hand. The Express Bus Terminal (Central City, Shinsegae Department Store, underground shopping center, City Airport Terminal) and Seoul Arts Center can also reached by bus. Guests can also reach Nambu Terminal within 15 minutes and a short subway ride (6 stops) will lead to Lotte World, Lotte Department Store and Lotte Mart. 1F Front Desk, Coffee Shop, Pub Restaurant "Amico"
B1 Fitness Center, Men's Sauna "The Spa"